I’m very excited about attending my first actual fibre festival. As far as I can tell, there don’t seem to be any events like them in Ireland, which is sad. Good thing is Fibre East is really easy to get to from Luton airport nearby. And so it’s a short hop for me from Belfast airport. They did the site over and it looks great! The Ravelry group for Fibre East is very active, and so friendly. I mentioned when I was coming and I was offered a lift from the airport. How cool is that? I’m also volunteering on the Thursday before. I’m keen to meet folks and see what goes into these events. Uh oh, I need to learn how to spin wool?? I received the materials supplies list for the workshop I’m attending at Fibre East. I thought “Uh oh!” I couldn’t tell you what many of the items are and I don’t have most of them. But the main thing missing in my toolset is the actual spinning skill. I sort of knew this when I signed up, but I was sort of ignoring the fact, I guess? Meanwhile, the problem didn’t go away. Weeks have passed and I still haven’t touched the spindle. The workshop will be with Deb Robson, (Introduction to Wool Types), who I probably mention in every other post on this blog. So I wasn’t going to let a little matter of not knowing how to spin deter me for signing up. So I figure I wouldn’t get much out of just petting the wool all day at the workshop. I must be know how to spin the stuff. The fibre is from Winona Queen who apparently doesn’t even sell online anymore. 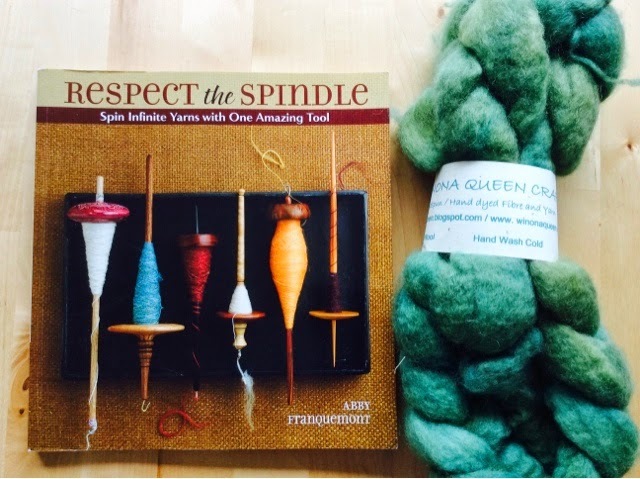 In Respect the Spindle, Abby Franquemont says you can learn spinning by practicing about 15 minutes a day for several weeks. Oh. Really? Well I have the book. And some fibre! I will be traveling to the US, so I hope I can find time to practice everyday. I’ll keep a log of my progress. 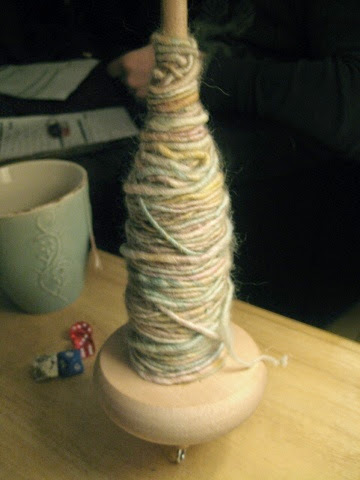 I should admit, I did try spinning before on a weekend meeting up with some Ravelry folks in 2008. This was what I ended up with during the workshop. But when I went home to try and practice what I had learned, all I got was a lumpy length of wool. Thick and thin and over spun. I have no pic of that! Anyway, I found it intriguing enough to buy some hand dyed roving. But never used it. Abby Franquemont is actually teaching a spindle spinning class on Friday. But that is day 2 of my fibre workshop. In a perfect scenario, I could have signed up for Abby’s spinning class first, ha ha! I am going into this area simply as an observer. I’m more interested in learning more about yarn, and what goes into it, who makes it. So I really need to be careful! It’s clearly an absorbing practice on its own. I was amazed by the scientific approach Rebecca of Niddle & Spindle is taking in her studies of the ratio of spinning to the staple length. Pretty cool!